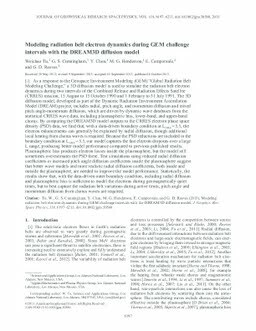 As a response to the Geospace Environment Modeling (GEM) “Global Radiation Belt Modeling Challenge,” a 3D diffusion model is used to simulate the radiation belt electron dynamics during two intervals of the Combined Release and Radiation Effects Satellite (CRRES) mission, 15 August to 15 October 1990 and 1 February to 31 July 1991. The 3D diffusion model, developed as part of the Dynamic Radiation Environment Assimilation Model (DREAM) project, includes radial, pitch angle, and momentum diffusion and mixed pitch angle-momentum diffusion, which are driven by dynamic wave databases from the statistical CRRES wave data, including plasmaspheric hiss, lower-band, and upper-band chorus. By comparing the DREAM3D model outputs to the CRRES electron phase space density (PSD) data, we find that, with a data-driven boundary condition at Lmax = 5.5, the electron enhancements can generally be explained by radial diffusion, though additional local heating from chorus waves is required. Because the PSD reductions are included in the boundary condition at Lmax = 5.5, our model captures the fast electron dropouts over a large L range, producing better model performance compared to previous published results. Plasmaspheric hiss produces electron losses inside the plasmasphere, but the model still sometimes overestimates the PSD there. Test simulations using reduced radial diffusion coefficients or increased pitch angle diffusion coefficients inside the plasmasphere suggest that better wave models and more realistic radial diffusion coefficients, both inside and outside the plasmasphere, are needed to improve the model performance. Statistically, the results show that, with the data-driven outer boundary condition, including radial diffusion and plasmaspheric hiss is sufficient to model the electrons during geomagnetically quiet times, but to best capture the radiation belt variations during active times, pitch angle and momentum diffusion from chorus waves are required.